Modern kitchens are bright, open, and full of counter space. To add extra counter space, homeowners may choose a built-in 1 kitchen island 2 or peninsula 3. A peninsula 3 juts out from an existing wall or counter, and an island 2 stands alone in the kitchen. They each provide a dividing line from the kitchen to the next room without the intrusion of a wall. We provide information below to help you decide which is right for your kitchen. According to the National Kitchen and Bath Association (NKBA), the measurements of the work triangle of the kitchen — sink, stove, and refrigerator — must be carefully preserved. The sum of the distance between each of these elements should be no more than 26 feet. Also, no “leg” of the work triangle should be less than four feet or more than nine feet. At no time should this triangle be blocked by a tall object like a refrigerator. By using these measurements, you ensure that placing an island in a kitchen will not interrupt the flow among the points of the triangle. The kitchen should offer ample space and a clear path for the cooks to move among the design elements. An island offers access to the center workstation on all four sides and frees movement through the kitchen with a circular pattern around the island. This allows friends and family to be part of the kitchen activity without being in the way. Because part of the island faces the next room in an open floor plan, storage is not limited to kitchen items. Cabinets beneath a snack bar, for example, might be used for seasonal items or tablecloths for the dining room. An island requires at least 36 inches of clearance on all sides for a walkway and at least 42 inches for the workspace according to the NKBA. You may need more if a refrigerator, oven, or dishwasher open towards it. In fact, this space requirement can make placing an island in a small kitchen almost impossible. Unlike islands, peninsulas do not take up a great deal of open space in a kitchen. However, the disadvantage of U-shaped peninsulas is the dead space created in the corner where the peninsula and wall or cabinet meet. 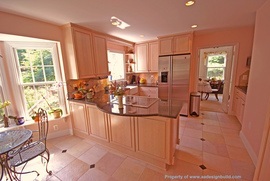 It is hard to use that counter space or the undercounter space beneath the peninsula. Another difficulty is limited access to the kitchen. With a U-shaped peninsula in place, access to the kitchen is limited to one or two entrances. This can create a traffic flow problem with guests or a large family. Despite these drawbacks, many people still enjoy the functionality of their U-shaped peninsulas. A better solution for the smaller kitchen might be the perpendicular peninsula. It has the appearance of an island, but it only has circulation around one end. This reduces the amount of space required to install it, giving it an advantage over an island. Its design also increases storage space over that of a U-shaped peninsula. Both islands and peninsulas can be built in varied sizes depending on the space available. They can be as small as a butcher block station or three-seat peninsula snack bar or as large as an island with a cooktop, sink, dishwasher, and seating for four. They can also serve more than one function. The space toward the kitchen can be workspace or an appliance and sink area. The side opposite can be used as seating at a snack bar or banquette for a casual dining space. 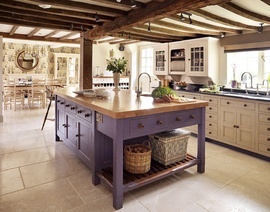 An island affords the homeowner two design choices. One is to match the style and construction of the rest of the kitchen to create a unified look. This will result in the same countertops, woodwork, and other design details. The other option is to use the island as a contrasting piece in the kitchen, choosing a different color and design scheme from the rest of the room or one that will transition into the next room in the open floor plan. A peninsula, on the other hand, will most likely be designed to blend with the existing cabinet space to create a unified appearance. If the other countertops are natural stone, particularly marble, matching them will be difficult and probably require the replacement of all the countertops. For these reasons, a peninsula limits the design choices. 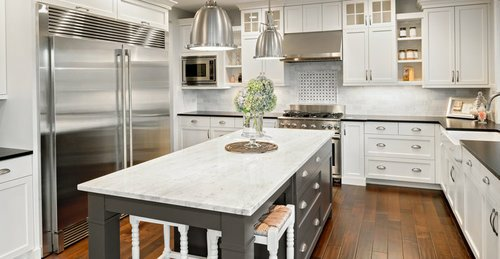 In many ways, the installation of a kitchen island and peninsula are the same, and both should be done by professionals. At the least, the services of a carpenter and countertop installer are needed. If a sink or appliances are to be added, then a plumber and electrician need to be involved as well. If the island or peninsula is installed during new construction, then neither is more difficult than the other. Plumbing and electrical wiring are installed in the earliest stages of development so that everything is in place for the placement of the cabinet structure and other amenities during the finishing stages. However, if this is a remodeling task with an existing kitchen, the peninsula will be the easier of the two. 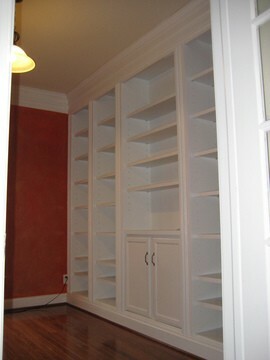 Cabinets and other structures can be built upon an existing row of cabinets or kitchen wall. Any electrical wiring may be pulled through the peninsula to where it needs to be for the added appliances or electrical outlets. If an island is added during a remodel, it will need to be placed properly in the existing floor space and then built from the floor up. Before planning installation, you should check local building codes for any size and clearance restrictions. The NKBA codes may be used as a reference, but they are always superseded by local codes and ordinances. If appliances are added, the electrician and plumber will cut into the existing flooring and perhaps the foundation to run the necessary wires and plumbing. This would be a difficult and expensive task. Most homeowners add islands or peninsulas during a total kitchen remodel, so our task is to sort out how much the island or peninsula adds to the overall kitchen remodel budget. The average kitchen remodel project costs approximately $101 per square foot of counter space. This includes replacement of cabinets and countertops, existing appliances with energy-efficient ones, and sinks and faucets. New flooring will be added and calculated separately using the square footage of the kitchen. 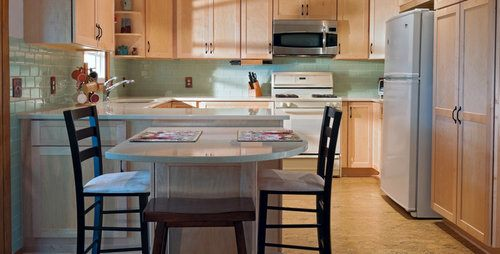 Since most islands add an appliance and possibly a sink to the island to preserve the work triangle, $101 per square foot would also be the average cost of the materials for installation of a kitchen island. Labor for an island installation requires the use of several specialists: carpenter averaging $70 an hour, electrician averaging $75 an hour, plumber averaging $55 an hour, painter averaging $28 an hour, and countertop installer for approximately $15 per square foot, depending on the type of countertop chosen. As an example, if we include a kitchen island of 24 square feet with a sink, dishwasher, cabinet space, and an overhanging granite countertop for seating, we will spend approximately $2,425 for project materials. Labor will cost approximately $2,075 for a total project cost of about $4,500. If you look at photos of the most popular kitchen peninsulas, you will see that few are more than cabinet and seating areas. Because the work triangle is not disrupted by the new addition, we do not have to undergo the expense of moving sinks or appliances. For a peninsula, we can use the average cost of installing custom cabinets with countertops, which is about $90 per square foot. We will only need the labor of a carpenter, electrician for outlets, painter, and countertop installer. This will reduce our cost of labor overall. For a kitchen peninsula of 24 square feet with only cabinets and an overhanging granite countertop for seating, materials costs will cost approximately $2,160. Labor will be approximately $970 for a total project cost of about $3,130. Placing the cooktop, oven, or sink in the island helps keep the area efficient, but doing this requires critical planning. First, to build a cooktop into an island requires a vent hood, which can interrupt the open space that is usually the goal of an island. Also, putting an electrical or plumbed appliance in the island is an expensive endeavor during a remodel, especially if the house is built on a cement slab. The plumbing for a sink or dishwasher will have to be added as well as the electrical wiring for a garbage disposal or other appliance. These types of island inclusions are best done in new construction. If you are working with new construction, then having a kitchen island increases the number of appliances and other accessories that a kitchen can offer. For example, a wine fridge or prep sink could be inserted into an island. This opens a world of possibilities. A peninsula is an alternative that can keep the triangle flow of movement efficient and still add extra space and interesting features to a kitchen. Electricity for a small refrigerator, oven, or microwave can be run from a wall to avoid moving through the floor. While having a kitchen island or peninsula will make your kitchen look beautiful if it is done well, it may not pay off regarding return on investment. Home buyers currently like the look of open space kitchens, but they may not pay significantly more for it. So add that island or peninsula, but don’t expect to recoup the money at the sale of your house. How much does it cost to install a kitchen island or peninsula in my city? Cost to install a kitchen island or peninsula varies greatly by region (and even by zip code). To get free estimates from local contractors, please indicate yours. A kitchen counter that is not attached to walls or other surfaces, and that can be accessed from all sides. Cost Considerations: Inexpensive options for a kitchen island are freestanding worktables or rolling carts, at about $200. Built-in islands can range from $600 to over $5,000. A metaphorical term for an extended kitchen counter space connected to the wall on only one side. Cost Considerations: Peninsulas typically run anywhere between $600 and $2,500, depending on their size and the materials used. Granite countertops tend to be the most expensive, averaging between $50 to $250 per square foot (including installation). On the low end, tile counters can cost as little as $10 per square foot.